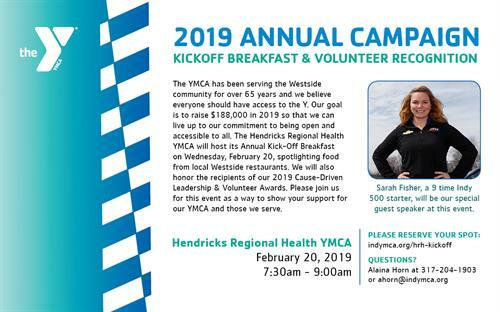 The Hendricks Regional Health YMCA will host its Annual Kick-Off Breakfast on Wednesday, February 20, spotlighting food from local westside restaurants. Our special guest speaker will be Sarah Fisher, 9 time Indy 500 participant. We will also honor the recipients of our 2019 Cause-Driven Leadership & Volunteer Awards. Please join us for this event as a way to show your support for the YMCA and those we serve. Wednesday, February 20 from 7:30a-9:00a. Check in and breakfast will begin at 7:00a. Visit indymca.org/hrh-kickoff to reserve your spot!